What imagery is more beautiful than an exquisite necklace gracefully adorning a woman's d�colletage? 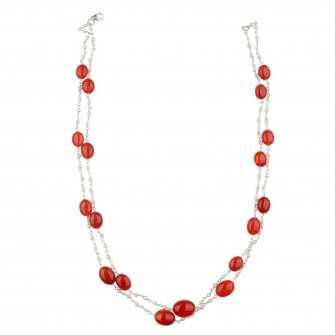 Extending its vision of extraordinary beauty to your everyday style, this beautiful silver sterling necklace applies an uncompromising design. Perfect your look for the upcoming party you are planning to attend. With unsurpassed brilliance, this excellent piece has superior craftsmanship, precise cuts and complementing colour. At once striking and classy to wear this masterpiece can be the highlight in your wardrobe. 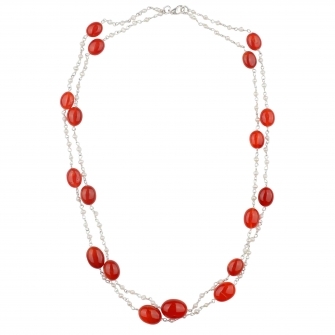 Let the spot-light be on you, featuring a striking design, beautiful embellishments of carnelian and fresh water pearl and a flawless finish, this necklace will add loads to your personality. Scroll to view more products.